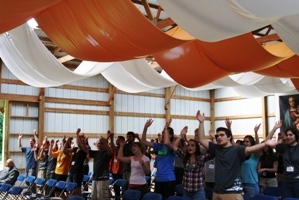 Originating from the European tradition of large youth gatherings held near religious communities, the Saint John Summer Conference, or SJSC, is a unique experience of spirituality, vibrancy, and joy within the Catholic Church. We began in 2009 with the desire to help young adults share the inner intensity of the spirituality of the Community of St. John and following the European spirit, we held the conference in a large tent behind our Priory, with approximately 60 attendees. In 2010, we nearly doubled our attendance as the word spread about the reverence of the liturgy and dynamism of the classes and presentations. In addition, we moved the conference indoors to better incorporate the beauty and peace of the monastic life. At last year’s conference we again increased the number of participants and made some well received adjustments. Most notably, we added small breakout sessions between talks so participants could delve deeper into the topics that most interested them. We found that the breakout sessions also made a difference in the community of young adults that formed at the conference. We will definitely include discussion sessions in this year’s conference. Also this year, we’ve decided to take a new approach. We are still going to be commemorating the last 4 days of Christ’s life and living in the spirit of the Community of St. John, but we’ve decided to focus our discussions, classes, and witnesses to a specific theme. We want to address topics that are important to young adults so that when you leave the conference, you take more than awesome memories of an encounter with Christ. While we still plan to have a profound experience, we want to also begin to equip you with the knowledge necessary to engage the world. As Catholic young adults, we need to make our voices heard in our often noisy world; we need to live authentically Catholic lives. Let the Saint John Summer Conference enliven your faith, answer your questions, and show you the path to a life of freedom in the Truth. We are hoping to have 100 or more young adults at the conference this year, so invite your friends!